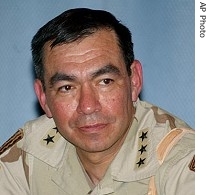 Yesterday Retired Army Lt. Gen. Ricardo Sanchez delivered the Democratic response to the President’s radio address noting that the Bush administration has failed to devise a strategy for victory and that we should start preparing to withdraw US troops. Sanchez is supporting congressional Democrats who want $50 billion in additional war funding linked to the goal of withdrawing U.S. combat troops by the end of next year. Senate Republicans would like $70 billion for the war without conditions. I don’t feel like I’m seeing any benefits of this war “to liberate the Iraqi people” especially when gas is still over $3.00 a gallon and the cost of food is rapidly rising in part to increased energy costs. What are the benefits of the Iraqi War to the American people? It’s already been proven that the Bush Administration lied to the American people about those Weapons of Mass Destruction, and maybe we should ask the Iraqi people if they actually feel liberated now that we’ve destroyed Baghdad’s municipal infrastructure, and arrested and tortured most Iraqi males affiliated with Iraqi’s former military. The only entities benefiting from the Iraqi War is the U.S. oil industry, Halliburton, Blackwater, all the contractors there engaging in war profiteering, and all the shareholders who own stock in those public companies? Your tax dollars are generating profits for these entities engaging in chaos over there in Iraq, and you’re paying over $3 dollars a gallon for gasoline! Don’t you think it’s about time you told Bush/Cheney you’ve stolen enough of my money? I don’t hear the U.S. oil industry thanking you for all the blood and cash you’ve donated so they can make record profits. How gutless are the democrats to argue that this war actually has conditions? The War on Terror…this is the war on making money. When is he running for office? I will vote for him. Why? Because he has a Spanish name? The Hispanic Congressional Caucus has plenty of Spanish surname representatives. And they seem to be only interested in enriching themselves. I served with LTG Sanchez, and he states the facts. We had no reason to Invade Iraq and it cost a lot of lives and money. We did not win in Iraq and Gen Petraus COIN strategy failed. But the American People are too ignorant to understand what COIN is and what is victroy. Everyone in congress is in it for the money not for teh counrty. Your anology applies to all not just Hispanics.